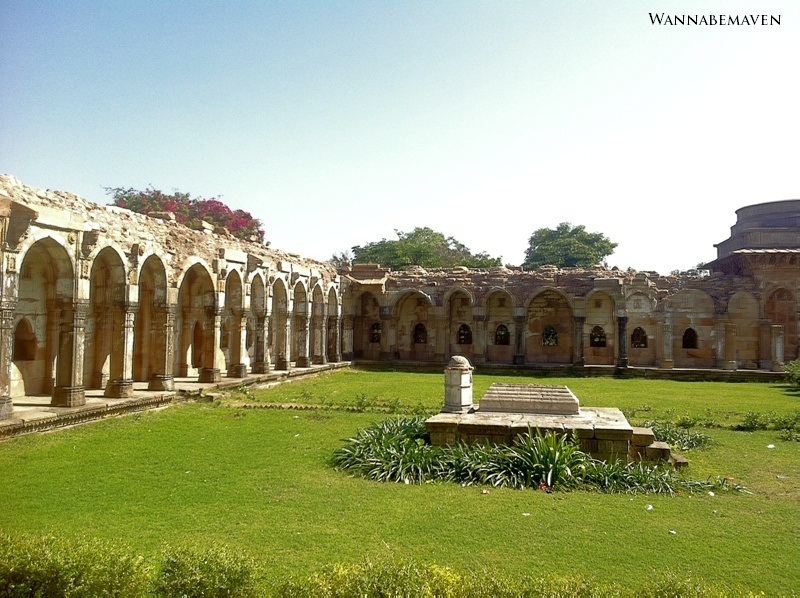 50 km from Vadodara is a UNESCO World Heritage site that has not received its due. 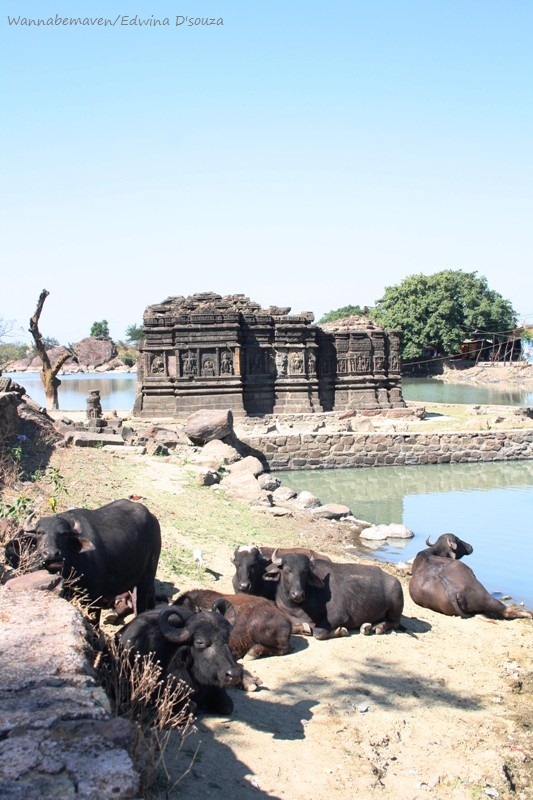 Champaner-Pavagadh Archaeological Park is disappointingly overshadowed by popular Hindu pilgrim site – Kalika Mata Temple. 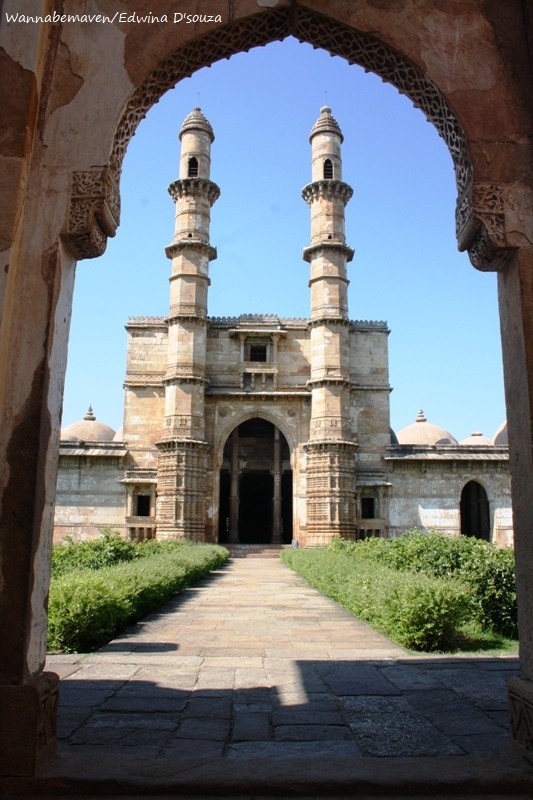 Champaner was ruled by Mahmud Begada, Sultan of Gujarat around 1484. He fondly named the city Mahmudabad and made it the capital of Gujarat. But Champaner’s glory was short lived. Mughal emperor Humayun attacked this flourishing city in 1535 and brought it to ruins. Champener never recovered from this catastrophe and remained a lost and forgotten city. 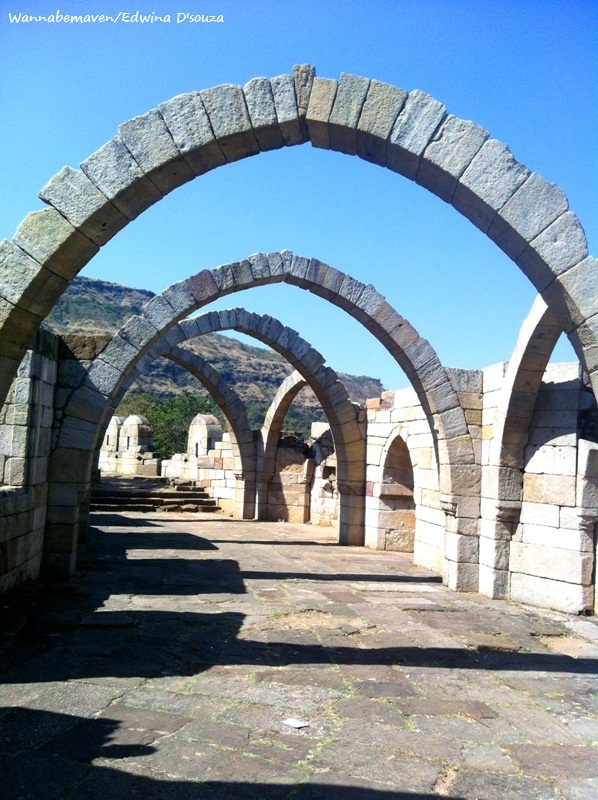 In 2004, Champaner-Pavagadh Archaelogical Park was bestowed UNESCO World Heritage status. 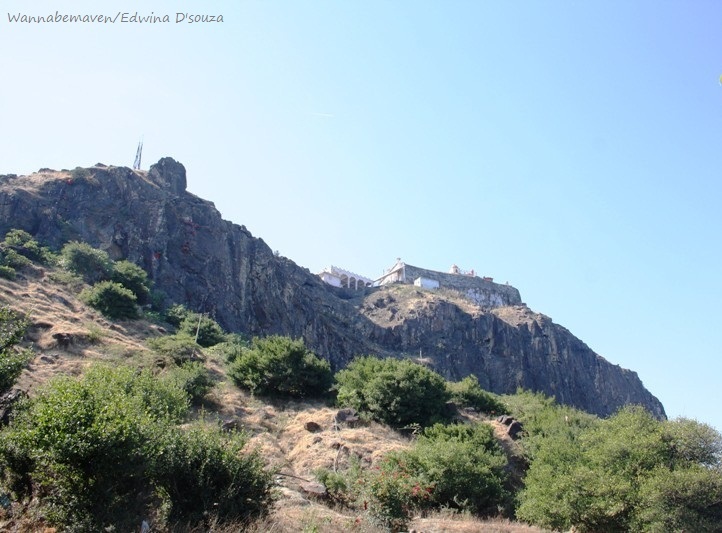 This has steadily helped Champaner-Pavagadh gather tourists and backpackers. I had the opportunity to visit this historic site earlier this year, and it was a spectacular trip. The ruins are tell-tale signs of its once flourishing existence and what remains of it now. Monuments are enclosed within sandstone fortifications. 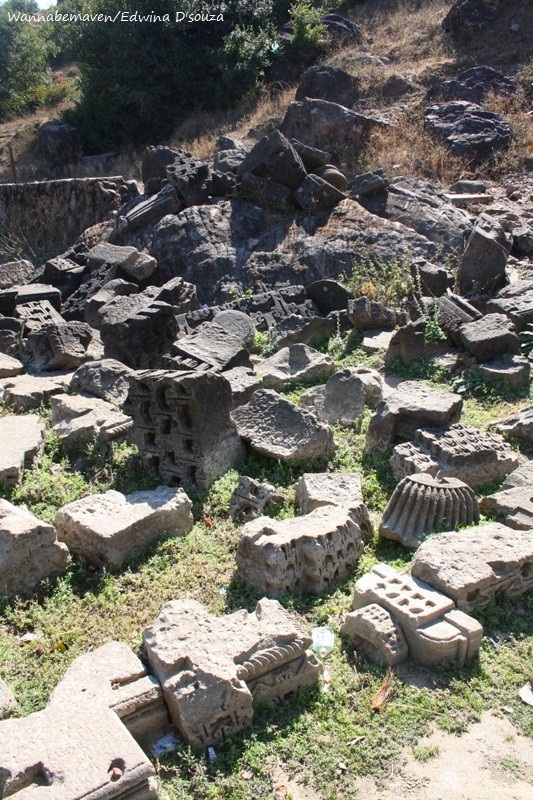 The Archaeological complex shares its premises with villagers living around the area. The site is a visual treat for tourists, witnessing a union of past and present. Mosques are a major part of the ruins spread over 6 sq.m. Primary among these are – Saher ki Masjid, Jami Masjid, Nagina Masjid, Kewda Masjid, Lila Gumbaj ki Masjid and Ek Minar ki Masjid. Saher ki Masjid or ‘Mosque of the City’ was built as a private mosque for the royal family and nobles of Gujarat Sultanate between 15th and 16th century. Two imposing minarets at the face of the structure, hundreds of geometrically perfect archways, elaborate dome ceilings and a sprawling garden make for a great sight. 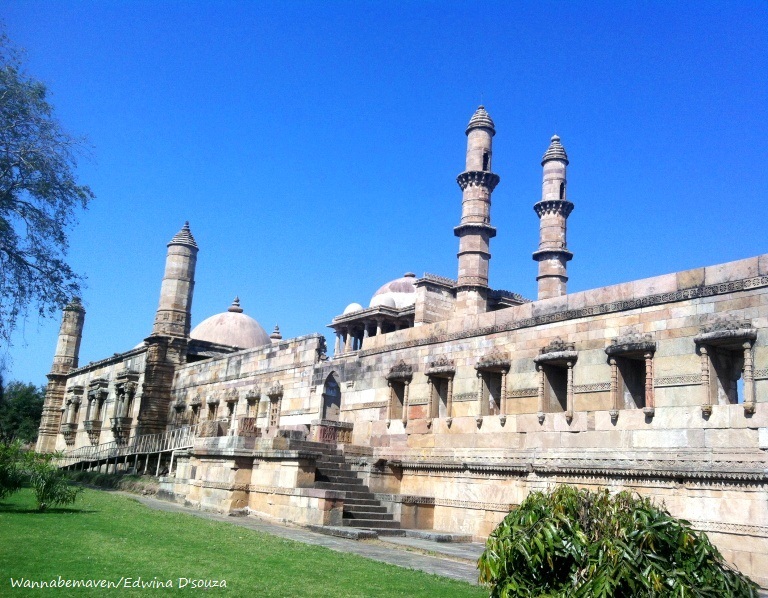 Jami Masjid is the most elaborate mosque inside Champaner-Pavagadh Archaeological Park. It has been a prototype for many mosques built later in India. Intricate carvings in Islamic style can be seen on arches, window panes and ceiling panels. Jami Masjid is considered the most beautiful Masjid in Gujarat. Prayer hall inside Jami Masjid has an exquisite marble (below) called Mihrab. It indicates the direction to face while praying. We were told, the marble is a mix of Hindu, Islamic and Jain architecture. Notice the ‘Kalash’ which signifies Hinduism, the circular shaped carvings are said to have Jain significance, and this was built under a Sultan’s rule. 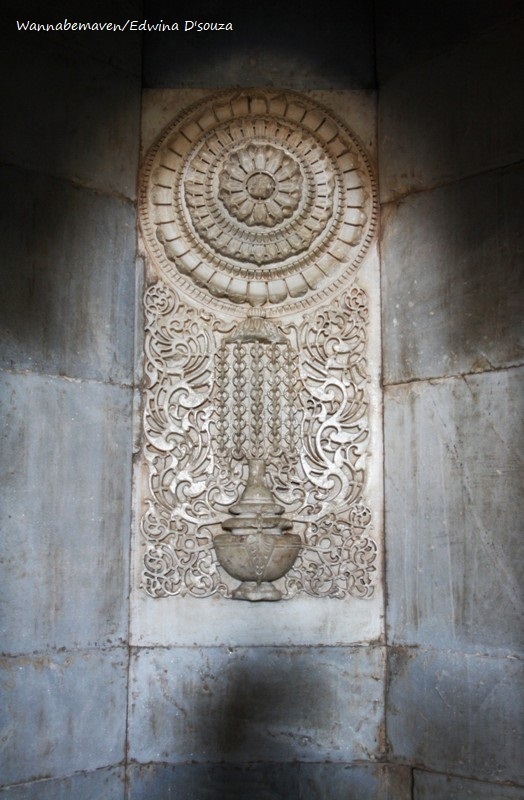 Water installations were popular in Champaner. It was not only used for daily chores but also aesthetics. There are water channels in palaces, gardens, pavilions and near mosques. 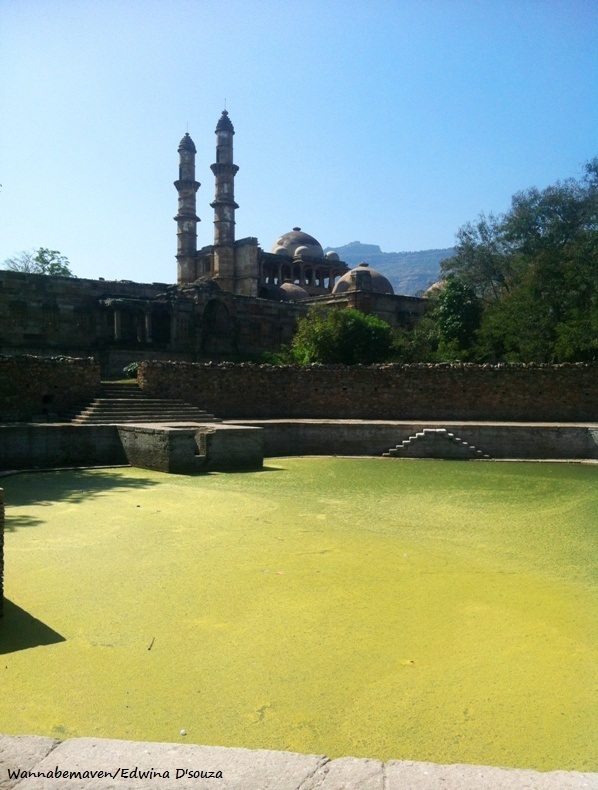 Below is a step well that overlooks Jami Masjid. Unfortunately, the water body is heavily contaminated. Right in the heart of Jami Masjid courtyard rests a tomb (supposedly of a temple priest). 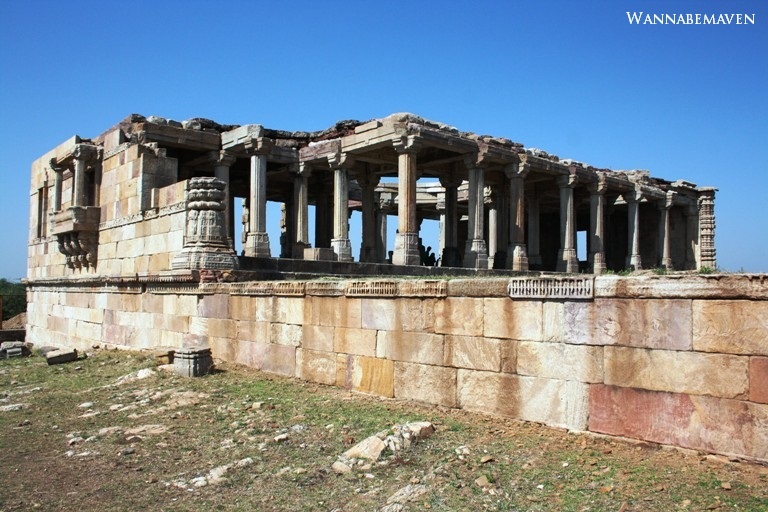 Kabutar-khana Pavilion has a multi-pillar structure (below) and another small brick and lime plaster structure that overlooks Vada Talao (lake). This place was used as a ‘Serai’ (or temporary shelter). ‘Saat Kaman’ or Seven Arches in Pavagadh is an architectural spectacle. 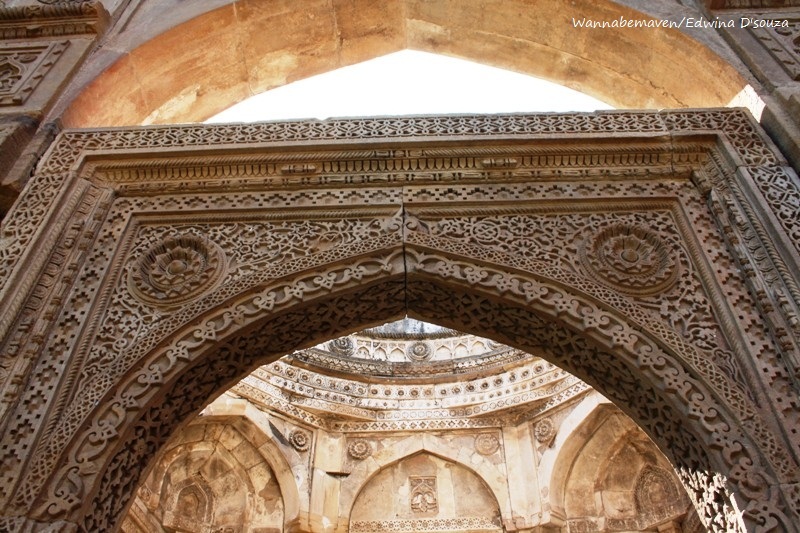 The stone arches have an interlocking mechanism that keeps the stones intact. No cement or similar binding material was ever used. Amazing, isn’t it? Seizing the opportunity, we also visited Kalika Mata Temple. 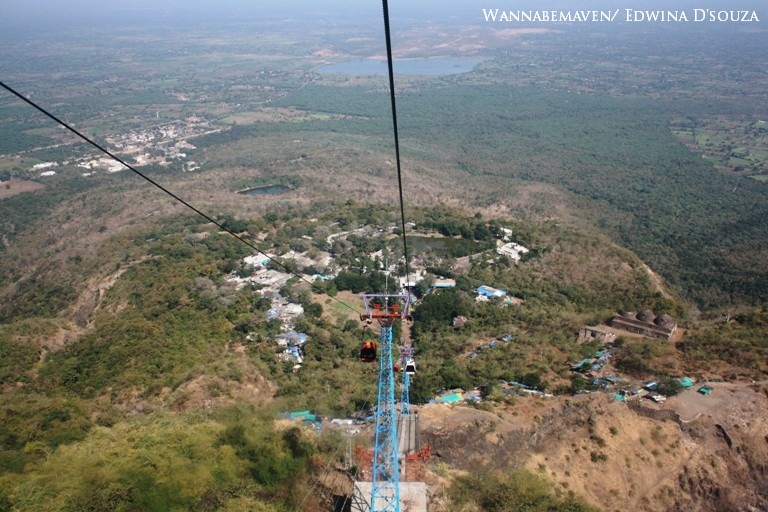 One can either hike uphill or take a 6 min ropeway ride that offers vistas of forest reserve, age old mountains and remains of Pavagadh Fort. Ropeway is followed by a 200 step climb to the temple. One is easily distracted from the exertion with views of colorful shops selling religious articles and flowers. Look out for funny make-do photo studios where one can pose with toy tigers, cardboard cars and motorcycles. Along the climb, we spotted this holy cow that gathered enough coins and offerings from devotees. 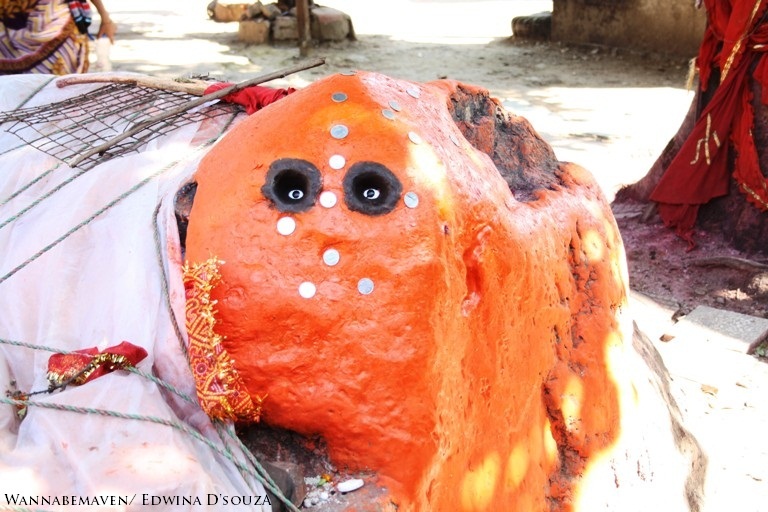 In the final few steps towards the temple, we spotted this Hanuman idol. It was interesting and equally amusing to see devotees stick coins on the idol, either to pay their respects or for wishes to be granted. 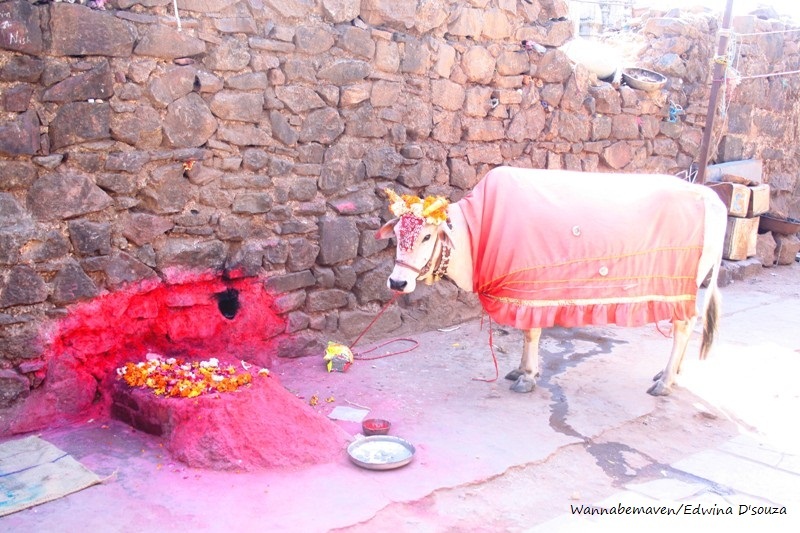 Kalika Mata Temple is one of the Shakti peeths with great religious significance for devi worshipers. Hundreds of devotees visit Pavagad every single day, but the temple is at its festive best during Navratri. A popular story floats that Baiju Bawra, a 16th century musician, was from Champaner. He was born mute but goddess Kali lent him his voice. 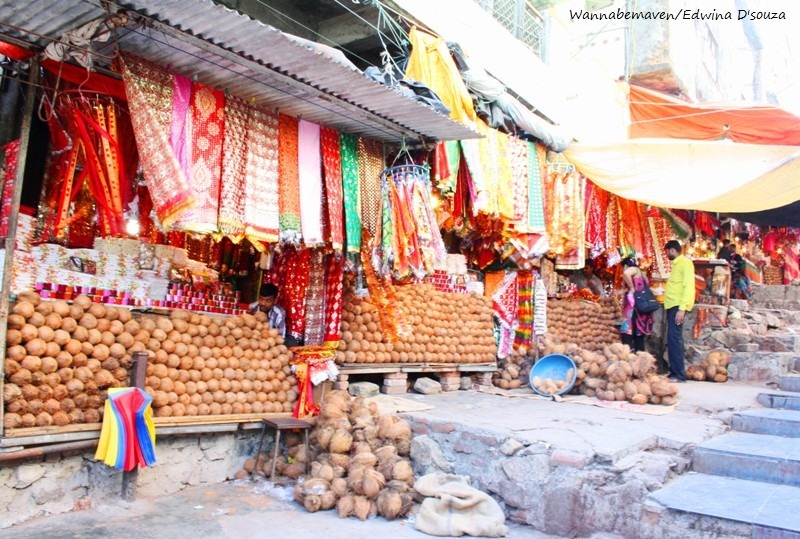 After offerings inside Kalika Mata temple, climb the temple top that has a small Muslim shrine. It sets a perfect example for religious harmony. 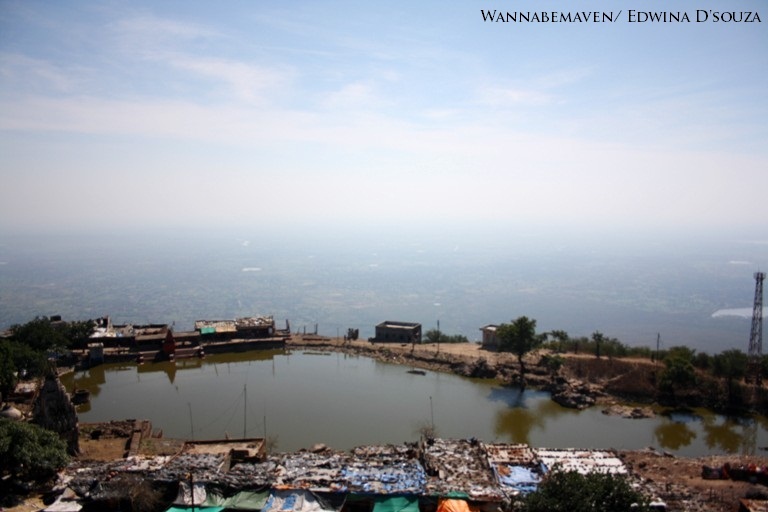 The point is also the highest on Pavagadh hill and offers a spellbinding view of Champaner-Pavagadh. On the way back to base of the hill, make a quick stop at Lakulisa Temple. 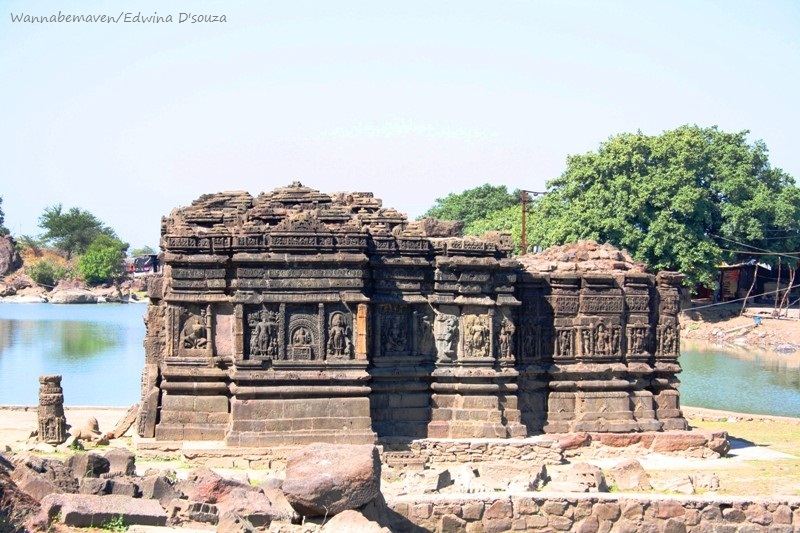 It dates around 10th century and has some very detailed carvings of Hindu Gods. The temple makes for a picturesque view with a small lake in the background. There are shanties and cattle near Lakulisa temple but I wasn’t complaining. On the contrary, I thought it added more character to the surrounding! Saher Ki Masjid is the starting point for your exploration. 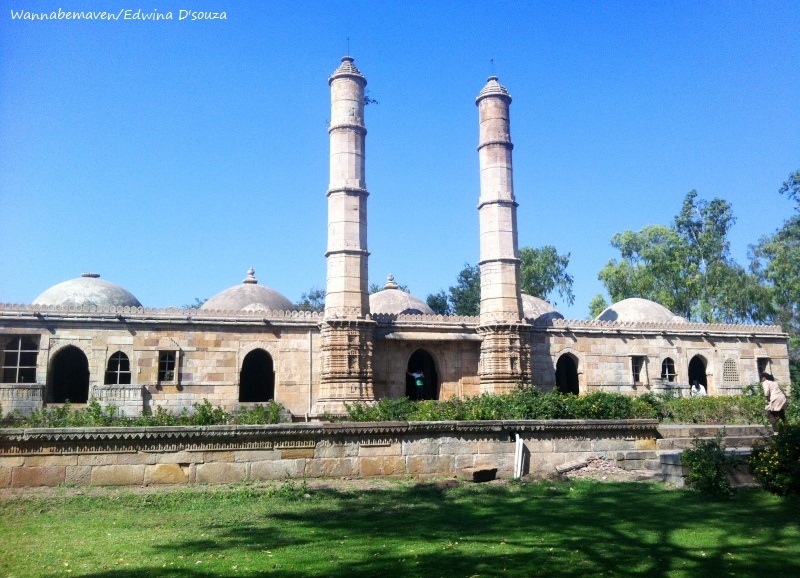 It is where you buy your ticket for Champaner-Pavagadh Archaeological Park (Rs. 10). There is hardly any literature at the ruins. It is not only advisable to buy a guidebook (Rs. 100), but, if possible, also hire a guide (Rs. 500). You will find guides near the ticket counter near ‘Saher ki Masjid’. Champaner Hotel near the ropeway is the only decent hotel around the area. Roadside food stalls are plentiful. The best food advice is to avoid experimenting. You are allowed to take your vehicle inside the archaeological park while exploring the ruins. Architecture, Heritage, History, Mosques, Mughal Architecture, Photo Essay, Road Trip, Temples, UNESCO World Heritage. Bookmark. Good write up. I wonder if ladies are allowed to enter the mosques here? thanks a lot, Vimmla ma’am.